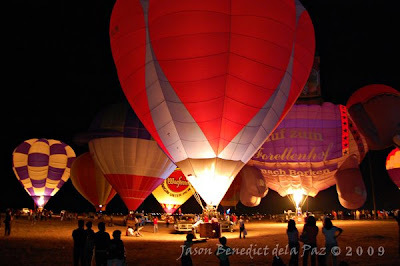 I had a chance to join my friends from Marikina Valley Community Portal, Dennis, Jil, Elbert, Randy and JC, in watching the Hot Air Balloon Fiesta in Clark Airfield last Saturday, February 14, 2009. Despite not feeling well, I didn't miss the opportunity to watch it for the first time. We left Marikina before 3:00 AM, all a bit sleepy since we only had a few hours of sleep but I think we were all excited to be there. It was so dark outside and very cloudy; we were comfortably driving along the North Luzon Expressway (NLEX) where only a few vehicles can be seen at that time. We decided to take the Subic Clark Tarlac Expressway(SCTEX) going to Clark but we inadvertently missed the turn and ended up driving a lot longer than we should have. We also had to take a U-Turn and drive back all the way to the supposed turn going to Diosdado Macapagal International Airport (DMIA). We reached DMIA just a few minutes before the Hot Air Balloon Fiesta formally opens. I was impressed with the conduct of the National Anthem where they had the Philippine Flag flying in the sky being held by three (3) paragliders. 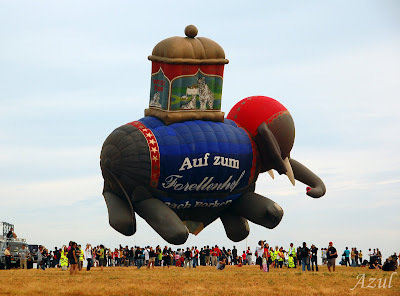 After the National Anthem, I have watched the colorful hot air balloons being inflated and released slowly in the air. There's even an elephant-shaped balloon, a coke bottle and a coffee mug. It was a fascinating sight. We also got to watch the awesome plane flying exhibition. Thanks to Jabey and Randy for the pictures! Nice pictures.. I saw these pictures from one of my blogger friend too.. look so much fun.